There are two consistent seasons in Florida (AKA “home-sweet-home”): summer and not-summer. Florida and Summer are best friends, I’m sure of it. During the not-summer months (also known as “winter”) Florida must hang with her good ol’ buddy Summer. They are true best friends with a love/hate relationship in full effect. One moment Florida must hang with Summer. Then, they break off their friendship and the sixties roll-in. Trust me friends, sixty is cold… break out the parka and boots! During the official summer months, Florida and Summer are best friends…completely in love with each other. Think of weather in the hundreds and the scorching sun beating down on your “I-just-can’t-take-it-anymore” shoulders. After spending much of the not-summer months in the house (sixties are way too cold for venturing out), the presence of Summer means it’s time to play! Beaches must be visited. 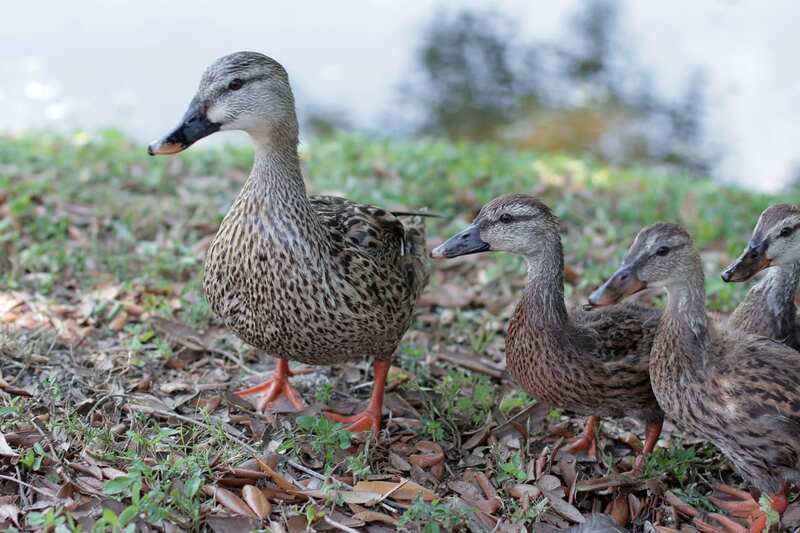 Don’t forget the neighborhood ducks to visit and juicy watermelon to eat. All this fun means sun protection must be planned. In our pre-simple days, sun protection consisted of a bright pink tube bought from the store. Slowly over the years I’ve changed the products we use for effective homemade recipes. 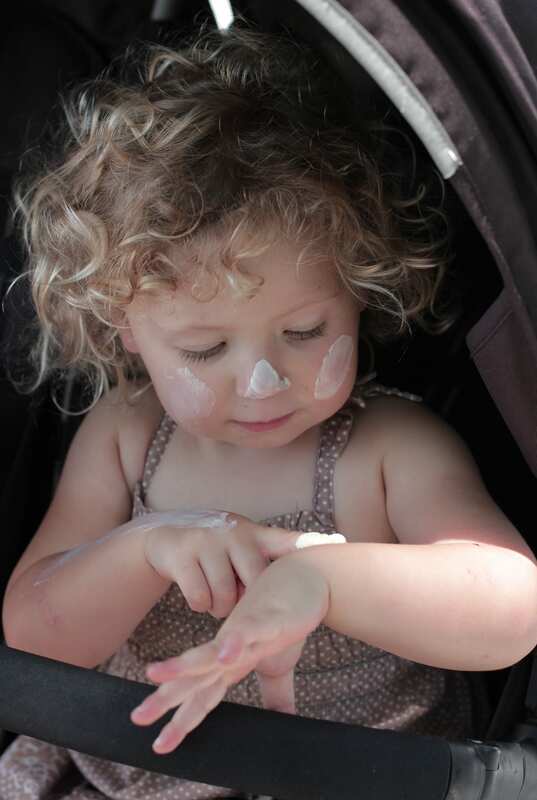 The thought of making homemade sunscreen appears daunting, at least it did to me! But, I’m here to say, “it’s simple”! I’m not a gal who enjoys complicated (“Live Simply”). With a few simple ingredients and ten minutes of time sunscreen can be made. Let’s talk about the simple ingredients. If you’re already making homemade products, you probably own a few homemade sunscreen ingredients. 1. Coconut Oil: Protects the skin and tissues from sun damage and successive exposure. Coconut oil doesn’t block the sun completely, allowing the skin to absorb beneficial Vitamin D. Consuming coconut oil during the summer months can help prevent sun damage. Make sure the coconut oil is pure and not processed. Note: Coconut oil alone will not protect against the sun. 2. Sweet Almond Oil: Contains a smaller SPF (around 5). Also provides Vitamin E which nourishes the skin. 2. Shea Butter: Contains fatty-acids along with Vitamins A & E. Shea butter moisturizes and provides a small amount of sun protection. 3. Carrot Seed Oil: Contains high levels of Vitamin A and boasts a high SPF (estimated around 30-40). I also use carrot seed oil in my homemade lotion for it’s amazing antioxidant properties. 4. Zinc: Provides physical protection against damaging rays and SPF. A non-nano zinc will not absorb into your bloodstream. 5. Beeswax: This ingredient simply solidifies the oil producing a spreadable lotion. Beeswax will melt when exposed to heat. Along with homemade sunscreen I also include foods in our summer diet which aid in sun protection, such as: dark leafy greens, berries, carrots, egg yolks, tomatoes, and sweet potatoes. When our family plans to be out for a long period of time (such as an all day trip to the beach), I add extra sun protection by using: hats, long-sleeve swim shirts, and a beach umbrella. I also reapply my homemade sunscreen throughout the day. With a few simple ingredients and ten minutes of time sunscreen can be made. Let’s talk about the simple ingredients. If you’re already making homemade products, you probably own a few homemade sunscreen ingredients. On the stove-top, add 1 cup of water to a small saucepan. Place a heat-resistant glass bowl on top of the saucepan. Bring the water in the saucepan to a boil, then reduce to a simmer. This creates a homemade double broiler to keep ingredients from over-heating. In the glass bowl add: coconut oil, shea butter, and beeswax. Melt the ingredients, stirring frequently. Remove the bowl from the heat, add to the coconut oil mixture: almond oil, carrot seed oil, and zinc powder. Stir. Once removed from the heat the beeswax will begin to set. For an on-the-go option: using a dropper pour into lip balm tubes [(like this)|http://www.amazon.com/gp/product/B00DQNFFDA/ref=as_li_tl?ie=UTF8&camp=1789&creative=390957&creativeASIN=B00DQNFFDA&linkCode=as2&tag=livsim07-20&linkId=ZJNSQIVV5SCFM2I7]. This option produces a small amount of sunscreen per tube, but I like the portability of this option. I keep a small tube in my purse (wrapped in a Ziploc bag) for just-in-case summer moments. The sunscreen will solidify after about five minutes. The final result will be a spreadable lotion. Using this recipe, I make one 4oz. mason jar and six lip-balm tubes of sunscreen. I’ve included “where to buy” links to show the products I enjoy using. Many of these ingredients can also be found at local health food stores. If you’re planning to be in direct sun for hours, I highly recommend using sun protection such as hats and protective clothing along with sunscreen. This sunscreen alone may not provide the full protection needed if you are fair-skinned and burn easily. Sunscreen is just one component of protecting the skin from the sun. 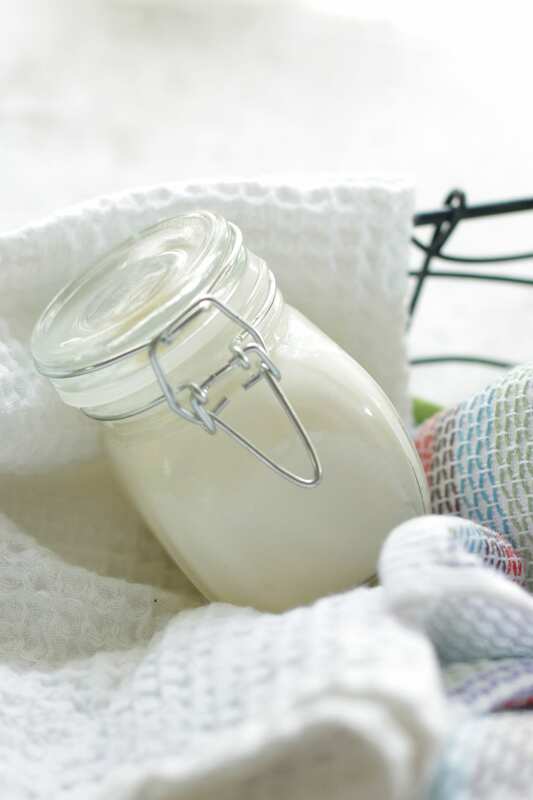 Homemade sunscreen can perform differently than store-bought sunscreen and should not be relied on for full protection during a long day at the beach or pool. I had no idea this could be done so easily, love this idea. And it is so much healthier too, no chemicals, etc. I will be trying this over the summer for sure. Thanks so much! Thanks, Real Food By Dad! I was amazed at how easy sunscreen is to make too. Enjoy! I’m a fair-skinned, freckled redhead who burns easily. Has this sunscreen been used on people who burn easily? Hey Elizabeth, I’ve used this without issue–I just reapply often. Thanks, Tara! She’s a cutie. This is great. Do you store this in the fridge? How long is it effective? Hey Rachel, The ingredients are shelf-stable, so I keep the sunscreen in our medicine cabinet. The sunscreen will keep for about a year when stored in glass. Enjoy! I have everything but the carrot seed oil- is there something I could substitute or could I just leave it out? Hey Kristi, You can leave it out. The lack of carrot seed oil will provide less SPF, but you’ll still have a good sunscreen. Hey Bri, Jojoba oil would be a great substitute for the almond oil. It’s nourishing and contains a fair amount of natural SPF. Thanks for sharing your recipe! I didn’t see a link for the non-nano zinc powder, so do you have any preferences as to where you buy yours? Hey Shauna, I didn’t include a link because I find it really hard to source a good non-nano trustworthy zinc. I purchase from two sources: 1/ a local shop in my town 2/ Scratch Mommy Skincare Shop. Scratch Mommy (link to her shop can be found under the recipe) sells non-nano zinc for DIYers to make their own sunscreen. I believe the smallest amount you can purchase is 2 ounces. Hope that helps :). Thanks for the suggestions! I’ll head over to Jess’s shop & look at her prices & then check my local health store. Have a blessed week! Thanks for the recipe. Do you know if places like whole foods carry zinc? Also – I’ve tried coconut oil as moisturizer on my face before but it caused breakouts, is there a substitute? Hey Shirley, I think you could sub shea butter for the coconut oil, but you may need to reduce the amount of beeswax. I’m not 100% sure, but that’s what I’m thinking. Thanks so much for this sunscreen recipe! I can’t wait to make it! I had a question though. Could I possibly leave out the zinc oxide? It sounds like the carrot seed oil has an SPF of around 30-40, would I need the zinc oxide if I’m ok with my sunscreen being an SPF of around 30-40? I’m just curious as to the need for it if the other ingredients are adding SPF on their own and the sum of them without it would be a good amount of SPF. Hey BreAnne, I’ve never tried using carrot seed oil alone. It’s a pretty expensive essential oil and needs to be mixed with a carrier oil. 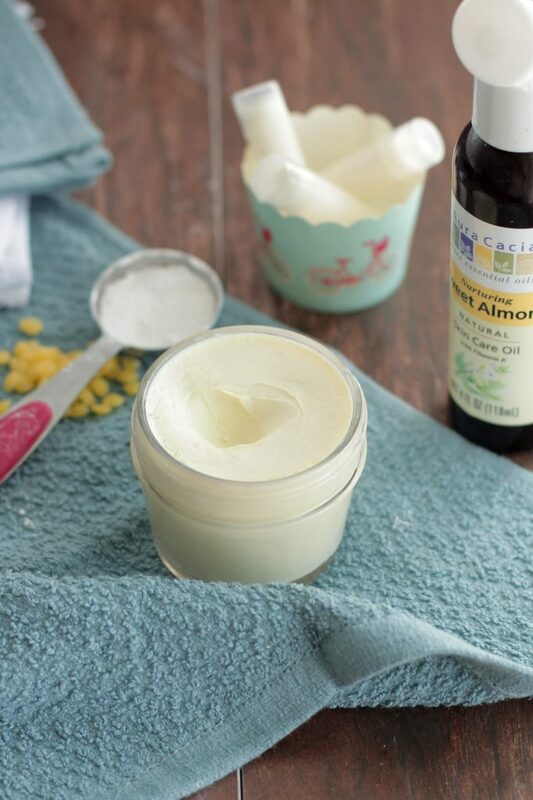 Each of the ingredients work together, but if you wanted to leave something out you could try the shea butter and almond oil. You may even leave out the beeswax, but it wouldn’t be a thick spreadable lotion, more of a coconut oil consistency. Actually I was thinking of just leaving out the zinc oxide but keeping everything else that you had in your ingredients list. I was just curious if it could all be combined (minus the zinc oxide) to create a good sunscreen. I recently made a lotion using shea butter, coconut oil, lavender essential oil and lemongrass essential oil. I made it using a double burner and love the consistency of it. So if I were to add in carrot seed oil to that combination it would give it an SPF of around 30, right? Hey BreAnne, I’m not really sure about taking out the zinc as it does play a critical role in the SPF. If you want to try I’d probably test a small batch without the zinc and see what happens. Let me know if you try. From what I gather I think her concern is the toxicity of the zinc. I’m no expert and haven’t done my own research but with that said, I’ve read several diy recipes out there over the last few days and many leave comments seeking a zinc alternative because of toxins found in it. Hey Tarrah, Thanks for clarifying. Zinc gets a bad reputation, but the zinc used in this recipe is very different than the zinc which absorbs from the skin into your bloodstream and becomes toxic to the body. I highly, highly recommend using non-nano zinc! Non-nano, uncoated, and non-micronized zinc won’t absorb through the skin into the bloodstream. Zinc is one of the key ingredients in this sunscreen. Scratch Mommy purchases large amounts of this kind of zinc- you can find her link above. About how much sunscreen do you get out of the ingredients you have listed? I have coconut oil in bulk so I am not counting that, but for me to buy the rest of the ingredients is over $70. How long can you let your kids go before reapplying this? Hi FitMomPam, Wow! $70! 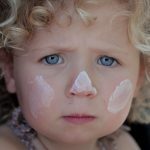 If it will cost that much I’d suggest buying Scratch Mommy’s sunscreen and see if you like it or maybe even trying this simple sunscreen and adding some carrot seed oil, if desired: http://www.backtothebooknutrition.com/2-ingredient-homemade-sunscreen/. For this recipe I get one 4 oz jar and about 6 tiny lip balm tubes worth. I reapply often- around every 2 hours when in full sun and that’s with protective sun wear too. Awesome, Ashely! I can’t wait to hear what you think of it. Essential oil does not contain vitamins. Carrot seed oil that is essential oil, like the one linked in your post, will not contain vitamin A.
I bought some of this oil too, thinking that it would, but then read up on it and found that not to be true. Thanks Megan for your feedback. That’s very interesting to read. I can’t agree that essential oils don’t contain vitamins with all the research I’ve done, but I’m always open to reading new research. There’s lots of different information out there about oils, did you have a preference to a different oil? Great post! 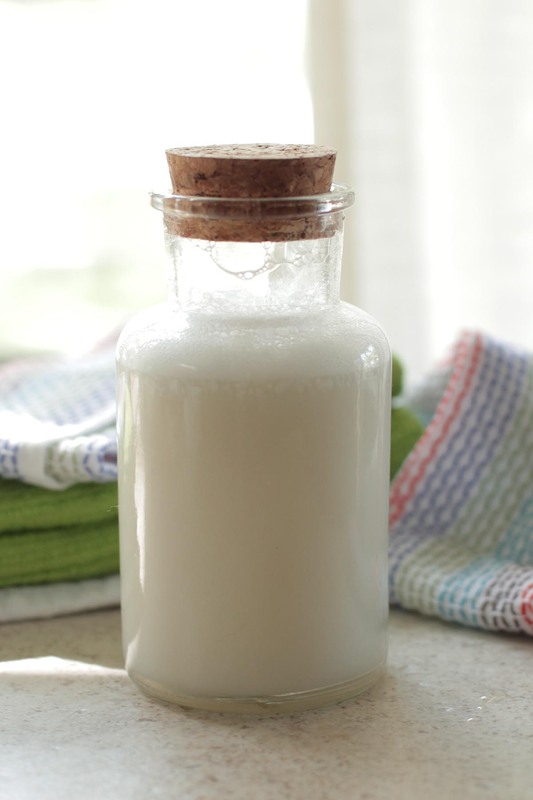 This homemade sunscreen recipe indeed looks very simple. I’m a little bit allergic to commercial sunscreen products and therefore think that maybe I can make my own. I assume this sunscreen is toddler-friendly too? How does this feel on your skin compared to commercial sunscreen? Also, how does it hold up to being in water? My boys are always complaining about the sunscreen burning their eyes in the pool or when they sweat. Hi Elizabeth, Homemade sunscreen does have an oily feel. It also needs to be reapplied often and used with other protection like hats, protective shirts for the kiddos, and an umbrella. After swimming the sunscreen sticks, but for added protection I always reapply once the kids and I are dry- I’m not sure how effective it is once you’ve been gone for a nice swim. Can’t wait to try this! When it’s finished, would it work in a a squeezable tube? Or is it too think and needs to be scooped out? Thanks for the recipe!! Hey Kelli, I think this recipe would work great in a squeeze tube. It’s thick, but more of a soft lotion. Enjoy! In regards to questions about leaving out the zinc, I don’t think this is a good idea. UVA penetrates more deeply into the skin than UVB, and is more dangerous in terms of skin cancer. What’s more, it’s UVB that causes sunburn, so if you use a sunscreen that blocks UVB but not UVA, it could give you a false sense of security in regards to your cancer risk. Zinc on the other hand blocks both UVA and UVB. Thanks for sharing, Ivriniel. The zinc really is important. Is there any subs for the coconut and almond oils? My son is allergic to all tree nuts and peanuts, sunflower and sesame seeds. Would any other oil work like avocado? Hey Christine, I wish the ingredients could be subbed, but in this recipe they are pretty essential. Thank you for sharing this! I’m going to try it very soon…maybe next week. What beeswax do you buy and where? Thanks! Hey Yarnninja, I buy it either on Amazon or from a local beekeeper. Enjoy the sunscreen! Thanks for the recipe! Have you used red raspberry seed oil in this recipe before? My daughter is very fair and was thinking of using both carrot seed oil and red raspberry seed oil for extra spf. Hey Sarah, I’m not sure how much the red raspberry oil will increase the spf, but I’ve heard great things about it! I always makes sure we have extra protection when using this sunscreen, particularly if we’re in the sun for many, many hours. So, just a bit more protection (sun shirt, hat, etc.) may help? Hello! I just ordered and received everything to make this recipe EXCEPT, I noticed my carrot seed oil is in fact Moroccan carrot oil…. Will this still provide the SPF I’m looking for? I don’t know the difference :/ it doesn’t appear to be an essential oil either but is for skin and hair. Please help! Hey Jamie, Many carrot seed oils are labeled, “Carrot Seed Oil” without the words “Essential Oil” included in the title. Does the ingredient label indicate the carrot seed oil is blended with another oil…maybe Argan? I’m thinking that’s where the Moroccan part would come into play? Hi,thanks for such an easy to make recipe! Now about the consistency, do you think this is a sunscreen i can send with the kids to camp.would my 8-9 year Olds be able to apply on their own? Hey Hela, As long as the kids are okay with scooping the sunscreen from a jar, I think they would/will do well with this recipe. Also, make sure they know it’s important to wear a hat and clothing protection since homemade sunscreen is not as potent as the sunscreen sold in the store, and is just one layer of added protection from the sun. if we leave out the beeswax will this be an oil that can be sprayed on? Hey Kim, I’ve never tried spraying the sunscreen sans beeswax, so I’m not really sure. It’s worth a shot! Am I reading the recipe correcrly, 4 tablespoons? All other recipes I’ve seen only call for 2. I want to make sure I’m right. Thanks! Hey Rebecca, Yes, that’s correct. I personally found 2 tablespoons wasn’t enough coverage. Thanks! I made some and really like it! Thanks for sharing your recipe! You’re welcome, Rebecca! I’m so glad you like it :). So, do you know what the SPF is for the finished product? Sounds great, thanks! Can this be used on your lips as well? I told my husband I would make him some lip balm today and I came across your recipe and have all the ingredients on hand. Hey Suzanne, I haven’t tried this on the lips, but I think it would work. Just made (like) this after searching recipes on pinterest. I had to skip the carrot seed oil (just lack it) and used cocoa butter instead of shea butter (have the first, lack the latter. I’m very much a “use-what’s-on-hand” kinda gal). I doubled the batch and added some Aura Cacia Mellow Mix (just love the smell). I scraped the jar to apply to my skin now, and it goes on not at all cakey; good even coverage. I put some into an old deodorant stick, too, which I’m looking forward to using. Thank you! Thank you for sharing, Grey! Enjoy!! Hey Hannah, Here’s a great list I refer to when it comes to essential oils and kids: http://www.thehippyhomemaker.com/essential-oil-safety-babies-children/. According to the list, carrot seed shouldn’t be used until 6 months plus. For now, I would recommend really covering up your sweet little one. Welcome to Florida!! Thanks so much! 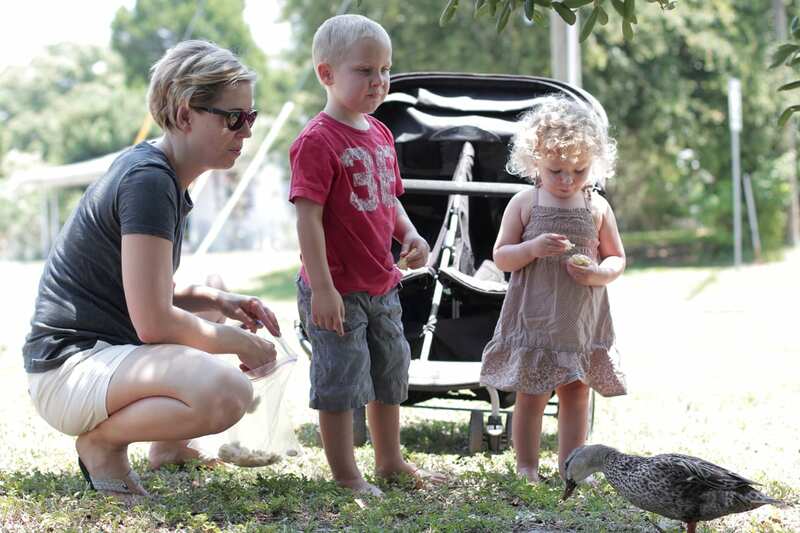 Maybe you could write a post for how to survive (naturally) in Florida with babies! Haha. I feel completely lost. I’ve lived in the Midwest my whole life! That’s a great idea, Hannah! We stay inside a lot during the summer, at least during the day and go out in the late afternoon/evening. We also eat lots of skin-nourishing foods, like berries and healthy fats. And when we go out, we cover up! It’s soooooo hot in Florida during the summertime that most of us don’t enjoy being in the sun for a long period of time. Thank you for the recipe! Will try it for body sunscreen. Am wondering what you would suggest for the face…acne prone and I know coconut oil doesn’t work for me and a little scared of the beeswax. Do you think I could make a two ingredient facial sunscreen of zinc plus tamanu oil or jojoba? Beeswax is breathable, so it won’t/doesn’t clog pores. 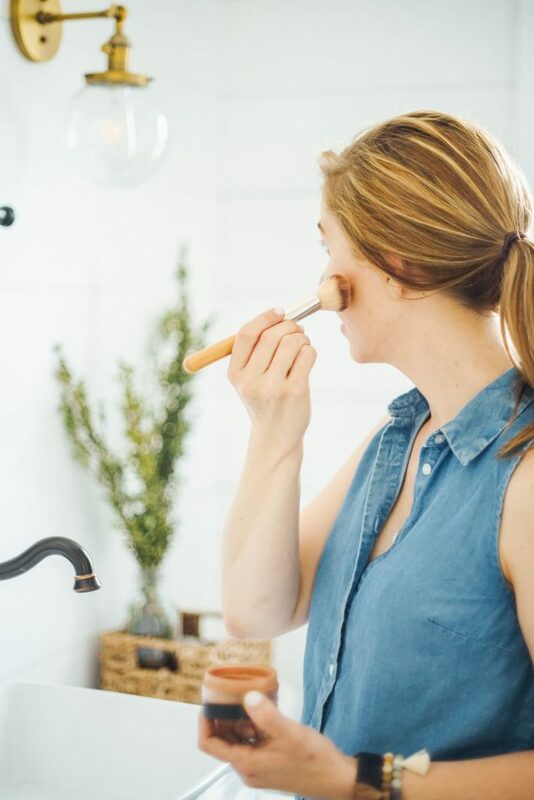 I actually use a combo of beeswax and oil to remove my makeup (including foundation now) each night: https://livesimply.me/2016/03/25/2-ingredient-makeup-remover-balm/. For the coconut oil substitution, here’s a list of oils that according to the author aid in sun protection: http://hybridrastamama.com/natural-oils-as-sun-protection/. is this sunscreen good for acne prone skin and also if you can tell me home made mosturiser recipe for acne prone skin . Hi. Thank you for your recipe! I’m having a tough time getting it to a creamier consistency. It stays quite liquid until it sets after I either pour it into jars or just let it set it the glass bowl. Do you have any suggestions? Hey Mandi, Does the sunscreen set once it’s cooled? If so, that’s normal. The beeswax needs some time to solidify, which doesn’t happen until the mixture cools. Or, does the sunscreen remain liquid even after cooling? If so, then I’d either increase the zinc a bit, or add a bit more beeswax. The zinc should improve the creamy texture, and the beeswax should help solidify the mixture. 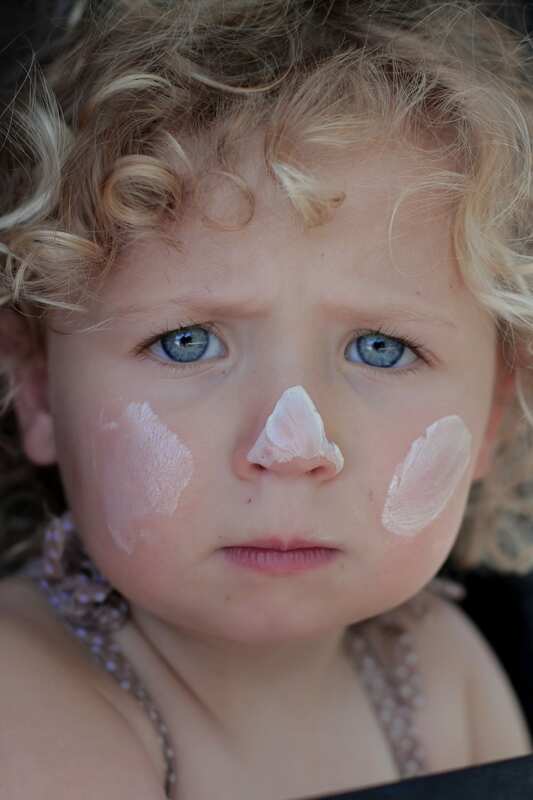 I’m all for natural products but I would never use a homemade sunscreen on either myself or my kids. I’ve done extensive research into it as I run a handmade cosmetic and body product business. The reason I wouldn’t is because of a quirk of zinc oxide (that’s what the white powder your calling zinc powder is) while it looks like the zInc is evenly distributed through the mixture zinc clumps on a microscopic scale, to small for us to see but unfortunately still enough to let UV rays through. Without lab grade equipment this is unavoidable and so it won’t provide protection as sections of your skin will be completely unprotected by the sunscreen. Getting a sunscreen formulation approved for sale as a sunscreen is actually quite difficult because of this. Could seem pretty intimidating but that is what would be listed on the label of this recipe if it was being sold in the states. One more point, this recipe doesn’t need it but any recipe that contains water should contain a preservative and grapefruit seed extract or vitamin E are not enough. If you don’t want to use a preservative then the product should be keep the refrigerated for no more than 3 days and then thrown out. Even if it still looks and smells OK microbes can still begin growing and could make you or your family very sick. Dry products or things with no water in them are fine unless they are likely to get water in them in the course of their use one example would be something like a jar of sugar scrub or an after shower moisturizer that you’re reaching into with wet fingers.soap is also fine (solid or liquid) as the ph is to high to allow microbes to grow. I know this may come across as very negative but the things I’ve mentioned have the potential to be life threatening but not many people know about them. I think it’s great that you want more natural alternatives for you and your family but I’d stick to commercial formulations of sunscreen and add a preservative to your water based recipes, there are some perfectly safe preservatives out there and while the most natural of them are a bit more pricey you only need a very small amount of them (typically 2-4ml per 100 ml of product) which should be only a few cents per batch. To my mind that’s a tiny price to pay for peace of mind that my family is safe. Thanks for sharing, Ursula! I agree, doing your own research and taking precautions, whether you’re making something or purchasing the product, are very important. What’s your shop/business? I would love to check out your products! Also, I’m curious about your recommendations for natural preservatives that you have found to be successful. Would you mind sharing what you’ve used? I’ve definitely done research into several options, so I’m interested to hear your suggestions. Thanks! My business is in Dunedin, New Zealand and I don’t have a website at the moment, I mostly just sell at markets, it’s Princess & Firebird Body & Bath though. As for preservatives I use 2 depending on what’s needed by the customer normally I use something called glydant plus which isn’t very natural but is very effective. If a customer wants something more natural then I use something called naturagard which is still effective but I have to use more of it and is more expensive. Unfortunately my supplier has stopped selling both of them and those are both brand names. You have a lot more selection available to you in the states than I do in NZ I suggest you have a look at the brambleberry site they should have some good information for you. P.S. I’m so jealous of the selection you have for cosmetic ingredients over there I have only about 1/10th of it here. Just made this and so far, I am very happy with the results. My family and I used it in the Florida sun and heat, and it worked great! Nobody got burned in the 4 hours we were outside. Before it set, I poured some in a small silicone tube from Target to squeeze out the sunscreen, and that was also very successful. Thank you for the recipe, and I will definitely make this again! That’s so great to hear, Julie! Great idea! I’m definitely interested in trying this. I have a hard time wearing conventional sunscreen cause my skin (especially my arms) tends to break out in hives as soon as my skin heats up from the sun. I’ve probably tried a half dozen different brands of lotions and sprays all with the same result of the hives. Would it be possible to substitute zinc powder non-nano with ground pumpkin seeds? I am scared to add this zinc powder to the recipe. The store that I bought some of the ingredients told me to use ground pumpkin seeds instead cause these has a lot of zinc on it. Please I need your reply. Hey Estrella, I don’t have any experience with using pumpkin seed powder as sunscreen. Personally, I wouldn’t do it. thank you so much for another wonderful recipe! I was wondering if there any way I can add aloe vera gel into this recipe? Thanks. Hey Julia, I personally wouldn’t since the mixture might not mix well and bacteria contamination could occur. What SPF number is your sunscreen? Hey Ginger, I don’t know an exact SPF for this.